Locker room benches provide the perfect space for athletes to sit down and get ready. If students are expected to get dressed for PE in the locker room, it is important to make sure that they have a comfortable place to do so. When you provide some attractive locker benches, you help students have a positive experience with high school athletics. Student athletes work incredibly hard, so they deserve your full support. What is the best kind of locker room bench? With locker benches in a choice of sizes and styles, you can find the best locker room furniture for your space. Why should you get locker room benches? Locker room benches offer student athletes a comfortable place to sit while they suit up or cool off after the game. Looking for a private place where the coach or team captain can give a personalized pep talk? A locker bench is just what you need. Sports games can get pretty heated, especially when there is an ongoing rivalry. With a permanent place to sit in the locker room, athletes can relax, take a deep breath and chill after a close call before going back out onto the field or court. With the innovation, quality and support of Penco Products, their locker benches are definitely a worthwhile investment. Their hardwood tops and heavy-duty pedestals are tough enough for the football team and star wrestlers. They are also easy wipe down so your dancers won&apos;t get dirty while lacing up their toe shoes. How should the locker room furniture be arranged? Figuring out just where to put a locker room bench and how many will fit in a given space can be complicated. There still needs to be enough space for every locker to be opened easily, and for people to walk around and arrange locker contents. Even with locker benches around so preparations can be done in a seated position, some people might still need to do things standing up. 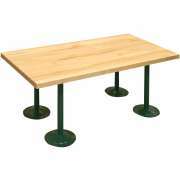 In order to help you leave enough open space between your benches, Hertz Furniture offers a number of different lengths. Worried that without experience you will have trouble figuring out just how much space is needed in between each piece of locker room furniture? The experts in the Hertz Design Center are happy to offer you free project planning advice. 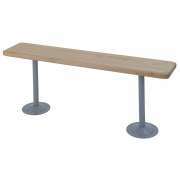 Locker benches can either be drilled in place or left un-mounted so you are free to move them around. Having the ability to move things around provides great flexibility. 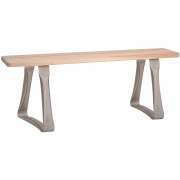 However, if you are worried about your furniture being misplaced or even taken, it is recommended to nail benches down. Some particular models have to be drilled into the floor. How can you make a locker room ADA compliant? You don&apos;t ever want a single student to feel like you don&apos;t care about them if you can avoid it. ADA locker room benches have extra-wide tops so every athlete can feel like an equal member of the team. ADA compliant schools take planning, and you can never be sure when a new student might enroll who needs special accommodations. Even if you don&apos;t currently know of anyone who needs ADA-compliant school furniture, it is always good to be prepared. No matter what sports your students are playing, they are sure to appreciate having a comfortable place to get ready. With a place to sit down and change after PE class, students will get back to their next classes quickly and in better moods. Locker room benches are a small addition that really goes a long way.